King Abdullah of Jordan has warned that failure to reach an agreement for peace in the Middle East will result in a new conflict within 12-18 months. In comments to the UK newspaper The Times, he said the US was finalising an ambitious "57-state solution" for peace that he is helping to prepare. The king said the plan would include proposals to settle Israel's disputes with Syria and Lebanon. His comments came ahead of Middle East debate at the UN Security Council. The UN meeting at foreign minister-level is part of a flurry of diplomacy ahead of visits by Middle East leaders to the White House later this month for separate visits. Also on Monday, Israeli Prime Minister Benjamin Netanyahu met the Egyptian president at the Sharm el-Sheikh resort, his foreign visit since taking office on 1 April. Meanwhile, King Abdullah travelled to Damascus where he and President Bashar al-Assad reportedly discussed a Saudi-inspired Arab peace initiative which offers Israel full diplomatic ties if it withdraws from occupied Arab land and agrees a solution for Palestinian refugees. BBC Diplomatic correspondent Jonathan Marcus says if a comprehensive approach really is put on the table it would be the first peace-making effort of this kind since the Madrid summit in 1991. If you cannot resolve a problem, make it bigger. That seems to be the approach of the new US administration if King Abdullah's assessment is correct. The king clearly backs a comprehensive deal which would not only seek to resolve the Palestinian problem, but would aim to bring peace between Israel and Syria and Israel and Lebanon too. It would lead ultimately to what the king described as a 57-state solution, whereby the Arab and Muslim world as a whole would recognise Israel. One fundamental problem is how to bring key non-state actors like Hamas and Hezbollah into any deal. Another problem is Israel's new right-wing government which seems unwilling to believe that significant opportunities for peace exist. 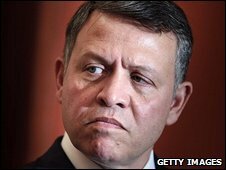 In his interview with the Times, King Abdullah of Jordan said that all eyes would be "looking to Washington". "If there are no clear signals and no clear directives to all of us, there will be a feeling that this is just another American government that is going to let us all down." He also warned that if Israel procrastinated on a two-state solution, or there was no clear US vision on what should happen this year, Mr Obama's "tremendous credibility" in the Arab world would evaporate overnight. "If we delay our peace negotiations, then there is going to be another conflict between Arabs or Muslims and Israel in the next 12-18 months," he said. King Abdullah said what was being proposed was a "57-state solution" that would include all 57 member of the Organisation of the Islamic Conference (OIC). "What we are talking about is not Israelis and Palestinians sitting at the table, but Israelis sitting with Palestinians, Israelis sitting with Syrians, Israelis sitting with Lebanese," he said. The Times reported that a plan might offer Israel entry visas to every Arab country, the right of Israeli national airline El Al to fly over Arab territory, and the eventual recognition of Israel by all OIC members. Israel would have to respond by halting the construction and expansion of settlements, and agree to withdraw from land taken since 1967. The right of return of Palestinian refugees and the future status of Jerusalem would be negotiated within the framework of the deal. Mr Netanyahu has not endorsed the establishment of a Palestinian state. His foreign minister Avigdor Lieberman has said the Israeli-Palestinian peace process was at a "dead end". Instead of a two-state solution backed by the US and the EU, Mr Netanyahu is calling for a "triple-track" peace process that includes progress on the political, security and economic front. King Abdullah said: "Just because there is a right-wing government in Israel does not mean that we should chuck in the towel." "I think we're going to have to do a lot of shuttle diplomacy, get people to a table in the next couple of months to get a solution." Is Israel heading for clash with US?